Section 102 and Schedule 11 of the Welfare Reform Act, (Clause 99) – Power to require revision before appeal. If anyone left in doubt that this Government’s policies are grossly unfair, and are intentionally punishing sick and disabled people – some of whom are amongst the most vulnerable of our citizens – you need look no further than Clause 99 for verification. Currently, claimants who are found fit for work can continue to receive Employment Support Allowance (ESA) at the basic rate by immediately lodging an appeal if they think the decision is wrong. ESA will then remain in payment until the appeal is decided. That is all set to change, however, under Clause 99 of the Welfare Reform Bill, intended to be effective from April 2013 – and according to the Department for Work and Pensions, from October 2013 that includes ESA and DLA decisions. Under the new rules, claimants who wish to challenge a benefit decision will no longer be allowed to lodge an appeal immediately. Instead, there will be a mandatory revision or review stage, during which a different Department for Work and Pensions (DWP) decision maker will reconsider the evidence and, if necessary, send for more information, before deciding whether to change the original decision. There will be no time limit on how long this process may take. The requirement for a mandatory review/revision before proceeding with appeal applies to all DWP linked benefits. During the review, no ESA will be payable, not even the basic rate. However, once the review is completed, those wishing to appeal may claim basic rate ESA again, up until the tribunal. It’s important that people know to request this continued payment from the DWP, once they have lodged their appeal. Call me a cynic, but I don’t believe this is the genuine reasoning behind clause 99 at all. The successful appeals to date provide a growing and substantial body of evidence that the Work Capability Assessment isn’t fit for purpose. People are being wrongfully denied their claims for ESA. Mandatory review will make it very difficult for people to continue with an appeal, since their lifeline income will end for an indefinite period until the review is completed and they can proceed with appeal. You will also have to appeal directly to HM Courts and Tribunal Services – this is known as “direct lodgement” – as DWP will no longer lodge the appeal on your behalf. DWP has agreed with the Tribunal Procedure Committee to introduce time limits to stipulate how long DWP has to respond to an individual appeal. The DWP is currently discussing what these time limits might be with the Tribunal Procedure Committee. That is assuming, of course, that people manage to circumnavigate the other consequences of this legislation. There are some serious implications and concerns about these changes. Firstly, there is no set time limit for DWP to undertake and complete the second revision. Secondly, claimants are left with no income at all whilst they await the review, and until appeal is lodged. The DWP have stated that there is “no legal reason” to pay a benefit that has been disallowed during the review period. The only choice available seems to be an application for Job Seekers Allowance. (JSA) or Universal Credit. However, we know that people in situations where they have been refused ESA have also been refused JSA, incredibly, on the grounds that they are unavailable for work, (and so do not meet the conditions that signing on entails) or they are unfit for work, because they are simply too ill to meet the conditions. We know of people who have had their application for JSA refused because they attend hospital for treatment once a week and so they are “not available for work” at this time. Furthermore, the minimum waiting period for a new claim to be processed is 6 weeks. That’s 6 weeks with no income at all. Moreover, there is some anecdotal evidence of people being told by the DWP that in order to claim JSA, they must first close their original claim for ESA, since it isn’t possible to have two claims for two different benefits open at the same time. DWP are also telling people that this means withdrawing their ESA appeal. However, you have the right to appeal. Another grave concern is that although most people on income related ESA are automatically passported to maximum Housing and Council Tax Benefit, from the time that the claim ends, (and for whatever reason), eligibility to housing benefit and council tax also ends. However, I would urge people in this situation to contact the Housing Benefit office promptly to explain the situation – the DWP automatically contact the Council to tell them when someone’s eligibility for ESA has ended. It is always assumed that the person claiming has found work when their DWP related benefit eligibility ends. You may also apply for discretionary housing payments if you are likely to become homeless, and if there is a shortfall between your Housing Benefit, and rent costs. It’s also payable sometimes when you have legal costs. It’s certainly worth asking your Local Authority if you qualify for payment. There are limited funds available. I am informed that when an appeal is pending, providing the Housing Benefit Office is informed of this, there should be some support towards rent and Council Tax. However, this is going to place further strain and difficulty on people who are ill and disabled. Housing Benefit is calculated by taking the work activity or support component of ESA into account, and currently, when basic rate ESA is payable up to appeal, some claimants are not necessarily eligible for the maximum Housing Benefit awards. It’s therefore possible that Housing Benefit entitlement will be lower, with no basic rate ESA being payable after April 1st. I would urge people to contact their Local Authority as soon as you know your ESA award has ended, because otherwise they will simply close your Housing Benefit and Council Tax claim. 1) When is the intended implementation date? legislation can be accurately analysed subsequently? payments could be affected indefinitely? The response informed that the planned implementation date is April 2013, and “the DWP will conduct a formal public consultation in line with the Government’s code of practice on consultation. This does not include publishing a risk register or conducting a risk analysis. This is because all aspects of the proposed changes are considered during the consultation process and in the impact assessment and equality impact assessments related to the changes”. There are no plans to introduce a time limit, or to retain payments of basic rate ESA throughout the second revision and leading up to appeal. The DWP published consultation document “Mandatory consideration of revision before appeal” that could be accessed via the DWP web site under the heading “Consultations”. The consultation concerned issues relevant to the implementation and operation of the appeals reform provisions in the Welfare Reform Bill and invited comments on the draft regulations. I worked on raising awareness regarding the issues that the Government’s draft raised, as well as prompting and garnering responses to the consultation. I can also confirm that the Government response to the consultation did NOT take into account any of the concerns we raised collectively, in particular, regarding the lack of a time limit on the DWP to produce the mandatory review, and the withdrawal of basic rate ESA to those awaiting the review outcome . So, the consultation was evidently a sham, nothing more than paying lip service to an increasingly perfunctory democratic process. Given that basic rate ESA is exactly the same amount per week as JSA, we need to ask ourselves why the Government have withdrawn the ESA safety net for those wanting to appeal DWP decisions that they are fit to work. Why introduce another layer of DWP bureaucracy to the appeal process, and why is it the case that there is need for a second revision, if the first response is based on robust procedure and decision making, and yields accurate and fair outcomes? Of course we know that the outcomes are neither fair, accurate, or based on robust decision making. We know that some 40% of appeals for ESA were successful in 2011 and that this percentage rose to around 80% when claimants had representation at appeal. That is pretty damning evidence against this Governments’ claims that the system is working, and that many disabled people “can work”. It’s likely that Clause 99 has been introduced to make appealing wrongful decisions that we are fit for work almost impossible. Sick and disabled people are effectively being silenced by this Government, and the evidence of a brutal, dehumanising, undignified and grossly unfair system of “assessment” is being hidden. More than 10,600 people have died following being told they were “fit for work”, and this presents a significant statistical increase (from 310 deaths over the same period amongst incapacity benefit claimants) that correlates with the current system, and it is astounding that our Government have failed to address this. Instead, they have made the system even more brutally punitive, dehumanising and grossly unfair. Clause 99 is simply an introduction of an additional obstructive layer of Kafkaesque bureaucracy to obscure the evidence of this. This Government is oppressive and certainly bears all of the hallmark characteristics of authoritarianism. We need to be pressuring the government for the introduction of a time limit (on both legal and humanitarian grounds) as currently there is none. I did enquire to see if DWP had any internal rules or guidelines yet regarding a time limit but so far they have not. We also need to be pressuring for basic rate ESA to continue. That was a major part of the consultation response, too. Meanwhile, legal challenges to this unfair and totally unacceptable addition to the Welfare Reform Bill will be going ahead. Government’s response to the public consultation. The DWP published a short mandatory consideration of revision before appeal – Government interim response to public consultation which stated that the Department did not propose to make any significant changes to the draft regulations included in the consultation document as a result of the comments received. There is to be no time limit for the completion of mandatory reconsideration of decisions. No decision has yet been made with regard to paying ESA pending reconsideration but other benefits may be available to claimants where ESA has been disallowed. It was confirmed that housing benefit and council tax benefit will not be included in the mandatory reconsideration process. Where a person makes a late application for revision, the Department will be removing the requirement that an application for revision cannot be granted unless it has merit, and removing the regulation which requires that, in deciding whether an extension of time is reasonable, the decision maker cannot take into account the fact that the individual misunderstood the law or was ignorant that they could request reconsideration. In considering a late application for revision, the decision maker will look at whether it is reasonable to grant the application for an extension of time, and what the circumstances were that meant that the application could not be made within the one month time limit. The decision maker will still consider whether an any time revision can be made, or whether the decision should be superseded when considering a late application for revision as they do now. Where a request for reconsideration is made out of time, and the decision maker refuses the application to revise the original decision, the effect of the draft regulations is that there can be no appeal as the Secretary of State must consider whether to revise the decision before an appeal can be made. Update: No basic rate ESA will be payable whilst people await the mandatory review, to challenge wrongful decisions. No appeal can proceed until that has been done by DWP, there is no time limit on DWP to undertake the review. From April, you will need to send your GL24 appeal form (DWP leaflet “if you think our decision is wrong”) or a letter directly to HM Courts and Tribunal Services. How to appeal by letter. the appellant’s signature (or the signature of a person with written authority to act on their behalf). 28.10.13 for JSA and ESA. However, we are still hearing about cases where the mandatory review is being used already, and this ought to be challenged on the grounds that DWP have provided dates when clause 99 is to be implemented, and so ought to be working to that legal timetable. ESA – Appeal statistics – before the MOJ spin! Who is accountable and legally liable for the well-being of those deemed “fit for work”? Sign the WOW petition – a call for a Cumulative Impact Assessment of all cuts and changes affecting sick & disabled people, their families and carers, and a free vote on repeal of the Welfare Reform Act. It’s a call for an immediate end to the Work Capability Assessment, as voted for by the British Medical Association. “Everyone is entitled in full equality to a fair and public hearing by an independent and impartial tribunal, in the determination of his rights and obligations and of any criminal charge against him.” – Article 6 of the European Convention of Human Rights, and Article 10 of the Universal Declaration of Human Rights. Filled form in 3 months ago still waiting to hear back if I need ATOS interview. Had tribunal 4 years ago and won… dont think I can face this again. HOW do people survive on NO income? starvation or suicide seem only options! My son had a ‘reconsideration’ back in Dec 2012 ( re his ESA Appeal)…..hmm….we didn’t even know they ( the DWP) did them as no one had said anything and so we believed an appeal was only sent to a tribunal service straight away. What we don’t know of, we can’t ask about….all very odd and sneaky to say the least! Its getting hard to trust departments like these who don’t appear to follow their own rules or appear to make them up as they go along! Asked my MP about reconsiderations. No reply as yet! It seems to me that they take more notice of radical acts like setting the jobcentre alight than people commiting suicide. But then property is more valuable than people. So then… possibly a clue here as to how to make effective protest? I asked for a reconsideration in April of this year because I was put in WRAG and I nee to be put in the Support Group as my condition has changed considerably. Anyhow I got a letter back saying that I will need an ATOS Interview because the person deciding could not make his/her mind up about placing me in Support Group. That was in April, I rang up this morning the 27th of September and I got told that I am in a waiting list of many people who have the same problem as I am having with waiting for an ATOS interview which I have no desire of wanting because of my last experience with them a year ago!! this stinks and I have no money coming in from ESA because in July this was stopped and no hope of getting it back until I am placed into the Support Group. Suicide is an easy way out for anyone but not my option at all as I want to live what ever the outcome, even if it means trying to eat something I do not like because I am given it. Just because of posts you read on here don’t think you know people,don’t understand, I DO only too well. I have been to the brink and back and won’t comment on here about my mentality either. Okay, we can’t assume we know how others feel, cope or don’t cope. We have enough to deal with without fighting amongst ourselves here. We all experience depression differently, I know I don’t even have the same experience of it each time. But each personal account of the experience is equally valid. No, because unless you are in receipt of a benefit, you can’t claim an advance. Mandatory review is a reconsideration of your claim being ended. Reading all this is heartbreaking – sadder still is the fact our national media aren’t covering this. Those in hardship are gagged by the very people we thought would pick up the gauntlet on their behalf. Why? Because the likes of Sy News, The Daily Mail et al are cosied up to Cameron and his Cronies, gleefully publicising the minority “Benefit Cheats”, ignoring totally the plight of those in genuine need. 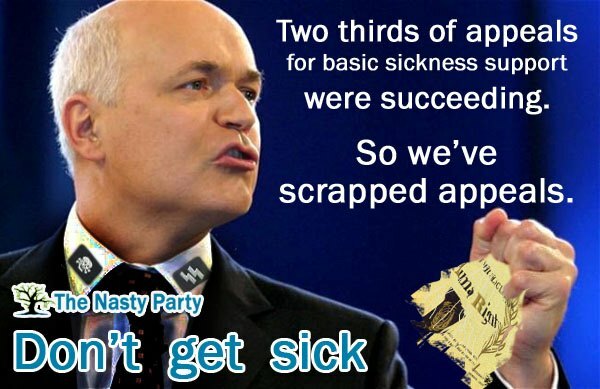 They want the “hardworking” population to despise anyone in need, the sick, disabled and vulnerable. They don’t publicise the many demonstartions happening around the country by various groups supporting the disabled and those affected by the bedroom tax. But much is made about the treatment of people in other countries who are suppressed and ill treated. Yet the glaring truth that the same oppression, mistreatment, injustice and inhumanity is meted out here in UK, is brushed under the carpet. To all of you who have posted your experiences, don’t stop fighting, don’t give in, get angry, indignant and fight back, believe truth will out in the end. And for those “hardworking” “able bodied” reading any of this, think on. Those relying on help didn’t choose to become disabled, sick or in need, circumstances changed their lives. Today you are fit, healthy and in a job and are able to hold your own. Tomorrow is another day and things change…………………………Life is a lottery and the next one to need help? Well. “It could be you”. Government are public servants…therefore in trust law..trustees. ….we the people are beneficaries …Is it possible to sue the government for any failure on their public responsiblity direct as they have delagated this away to private companies without due dillegence. …and lastly is HM courts and tribunal service run in practice by the crown, the government or private autominous group or entity…..never mind fairis the whole set up legal. I am long term mentally ill,Had an ATOS assessment in May and scored zero.The assessment was shoddy,I was read someone elses notes and had to point this out,at which point the interview ended quickly-after only 15 minutes.So,since 2nd of june to the present have had nothing to live on,have provided sick note and letter from my doctor to the DWP and as I’m going to a tribunal over this,I was informed that I’d get my ESA reinstated until the hearing.That was nearly 3 months ago.This has dragged on,I’m passed from one office to another,given conflicting advice and now look set to become homeless as I’m in a limbo situation.This whole situation has left me wondering if I have a place in the world,it seems like ATOS,I.D.S etc have made up their minds that I don’t. I’m past anger,just hungry,confused and hopeless.Really glad I spent 35 years in full employment paying tax,n.i etc,really feel like it was all worthwhile. Here! Here! As they’d say in Parliament! It varies, depending on what is discussed, what questions the panel may have and what you have sent in as evidence previously, sometimes. Mine lasted 10 minutes, as the panel had read all of the evidence – much of it was my own account with a brief report summary sent from my consultant to my GP, which he had printed off for me – and they had made their decision before I arrived. I hope your appeal is short and that the outcome is what you want, too. Good luck Hay. Have adhd,a severe anxiety stress disorder depression high blood pressure and asthma all get worse when stressed.got to go for another healh assessment(number 4) tomorrow. I am dreading it! I might as well ask who i appeal to when i walk in. I get 0 points every time i go.i have won 3 tribunals .i feel like im in a never ending loop of doom i just want to scream.its so hard to get through a day as it is and im scared ill loose it. Much sympathy to you and I hope you are as lucky as I was, and get a rare good doctor at assessment. I asked for my last assessment to be recorded, and it was. Previous assessors had produced reports that bore no resemblance to my real life struggles and the impact of my illness. 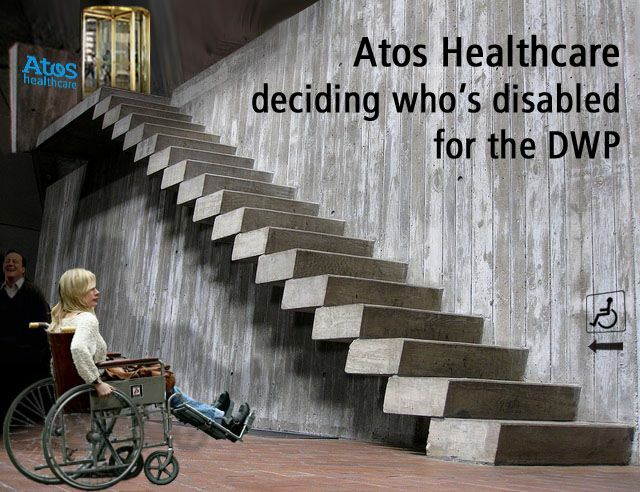 The Atos doc told me off record he would be recommending that I am put in the support group, and I was, he kept his word. He told me I wouldn’t have to appeal again.I collapsed, he even ordered me a taxi home which Atos paid for (unheard of). Interesting hindsight fact: it was revealed during the Beyond The Oakley Review: Work & Pensions Committee Re: Sanctioning Policy in late 2015/early 2016 that, when conducting Mandatory Reconsideration requests re: ESA decision refusals, DWP Decision Makers were ‘reminded’ in an internal email/memo that “80% of decisions were to be adverse [to the claimant]”, barely 3 months after ESA was launched.